The temperatures are dropping; snow begins to fly. Soon, our thoughts are turned to hearth and home, warm drinks, good company, and holiday cheer. But nothing dampens the spirit like that other winter arrival: the common cold. Take pearls, crab’s-eyes, red coral, white amber, burnt hartshorn, and oriental bezoar, of each half an ounce; the black tips of crabs-claws three ounces; make all into a paste, with a jelly of vipers, and roll it into little balls, which dry and keep for use. 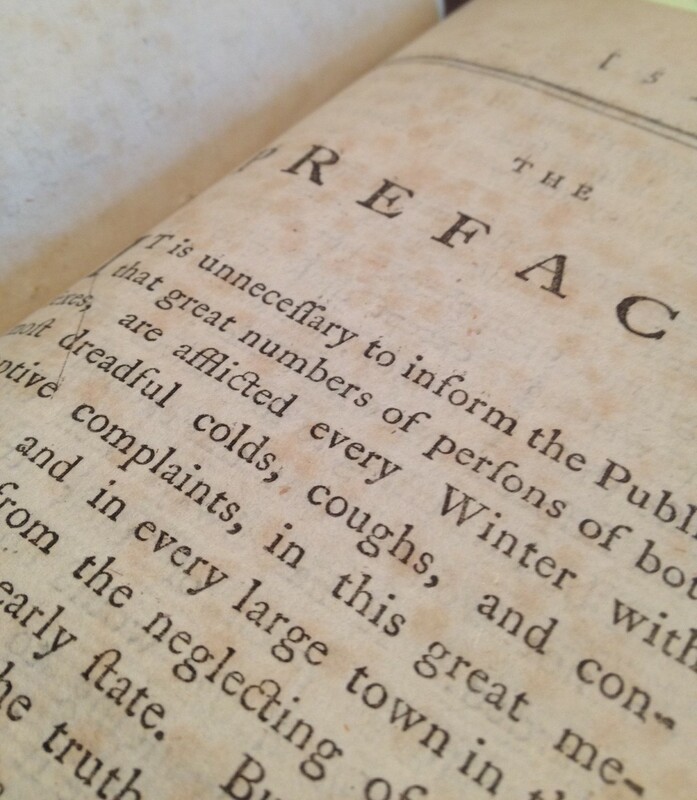 (See more) One interesting work on the common cold–and the dangers of ignoring it–comes from the Dittrick rare book collection: A serious address on the dangerous consequences of neglecting common coughs and colds : with ample directions for the prevention cure of consumptions / the fourth edition. To which are added observations on the hooping [sic] cough and asthma, by Thomas Hayes in 1786. 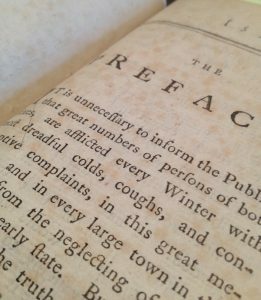 As Hayes is quick to point out, “great numbers of persons of both sexes are afflicted every Winter with most dreadful colds” (5). He blames the common cold for “an annual loss of twenty thousand persons in the island of Great Britain” and wonders, given it’s terrible consequences, why more attention isn’t paid to the matter. The whole purpose of his essay, in fact, is to “convince the public of the danger of depending too much upon that fatal expectation”–that of getting better on their own (11). Let’s take a moment to see how Hayes work stacks up to our modern conception of the common cold, shall we? Today, we understand that the common cold may actually be caused by any number of over 100 viruses, the rhinovirus being most prevalent. It enters the body by mouth, eyes, or nose, usually by touching commonly shared objects or by inhaling air infected with the droplets of someone else’s cough or sneeze. The cold, we now realize, does not cause colds, but we do see more infections in the winter. Why? Because we are in closer proximity to other people, the primary culprits for spreading the virus. Hayes also points out that left unattended, the cold may attack the lungs and become far more serious; the modern clinic will instead suggest that a worsening of symptoms means that you do not have a cold at all, but something much more serious (like a respiratory infection or flu). Hayes: In curing colds, three things are essentially necessary; to open the obstructed pores; to discharge any irritating matter out of the constitution and to observe such a kind of diet […] conducive to recovery. (32). The obstructed pores may be opened with heat, and with a variety of powders and tinctures (most of which sound rather alarming). Bathing in warm water and inhaling steam are also recommended and seem a bit more reasonable to the modern reader. These are to be followed by bleeding or purging, however, to remove the “bad” and make way for the good. But perhaps most interesting is the diet Hayes is pleased to recommend to patients suffering from cold. Take of barley water, six measures; white sugar, and powder of gum arabic, of each three drams; gradually mix one ounce of fresh and sweet oils of almonds, linseed, and olives. A dram or two of spermaceti (that is, the substance of the sperm whale cranial cavity) may be dissolved with double the quantity of mucilege of gum arabic, and a little sugar […] The spermaceti should be free of rancidity, and when the emulsion id made it should not be kept above twenty-four hours, as it is apt to ferment. (40-41). And what of today’s cure for the cold? Alas, there isn’t one! Antibiotics are of no use, and most over the counter remedies only mask or lesson symptoms. The greatest advice generally consists in drinking plenty of fluids , getting plenty of rest, getting good nutrition and vitamins, and–despite Hayes grave warning–waiting for nature to take it’s course!